A couple of happy guys - we did it! 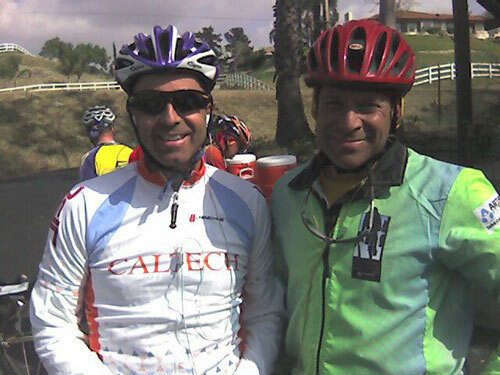 This story begins over a year ago, when Mark rode the Solvang Century in March 2007. At about the thirty mile mark he had a bad fall and thrashed his hip. He struggled to finish the century but did so, complaining of severe pain in his knee. Making a long story short after some false diagnosis he discovered he had cracked his hip. In fact, he had the Bo Jackson problem where the blood supply to his hip was interrupted, and he ended up getting his hip replaced on April 7, 2007. Mark that date. Being an avid cyclist and tough guy, Mark hatched a plan to rehabilitate via long rides, and set a goal of achieving the triple crown; three double centuries in one year. And he got me, somewhat reluctantly, to agree to join him. That was late last summer. We began by doing the Lighthouse Century together last September; Mark's first long ride after getting a new hip. That was a great victory for him and we discovered we enjoyed doing centuries together. (I can't link a blog post, because, well, I wasn't blogging last year. Boo.) You can't do these rides with just anyone; you need someone of compatible speed and climbing ability, and also compatible temperament :) I mean, we're talking 6-15 hours together. Flushed with success we rode the People Powered Ride the following weekend, two centuries in a week, and that "worked". Then we rode a 200K together in January (125mi) - which at the time was the longest ride I had ever done - and then a 300K together in February (185mi) - again a personal longest. And then we completed the Butterfield Double in mid-February, the first leg of the triangle. It was tough, but we did it. Which was all nothing compared to recent events. The Hemet Double is organized as two loops, each 100mi; many people ride just the first loop as a Century, and others ride both as a Double. The first loop is easier, but we were warned at registration that the second loop had been changed from previous years and was now "a bit tougher". Riight. We begin the first loop at 6:30, cruising through Hemet and Morongo Valley with no problems. Until, at about thirty miles (! ), Mark has a bad fall and comes down heavily on his [new] hip. His hand and arm are bleeding, and he is sore everywhere. Oh no! What will this mean? Can he ride another 170 miles? Being an avid cyclist and tough guy, Mark gets back on his bike. A little first aid, some ducktape, and we're off. The second loop is a killer. The first 25 miles features serious climbing up Sage Canyon, and we reach the first checkpoint at Vail Lake exhausted, with 75 miles left. Next comes a thrilling eight-mile decent down Pala-Temecula Road into the Pala Indian reservation; the whole way down I'm thinking "crap, we're going to have to get all this vertical back". And so we do; after a terrifying encounter with fast traffic on 76 (no bike lane and no shoulder) we have to come back up Rice Canyon, mile after mile of climbing. By the time we reach the second checkpoint at Rainbow, with 50 miles left, we are toast. Normally in a double when you have "only" 50 miles left, you feel like you're basically done, but this is different. The concern has shifted from whether Mark will make it due to his injuries to whether we will make it, period. The next section takes us mile after mile through the Lake Skinner recreation area - in the dark - up and down through rollers which are progressively steeper. Well probably they aren't, but they feel that way. We are on autopilot, legs moving, brains numb. Failure is not an option. Finally we make it to the last checkpoint - yay! - with only 25 miles to go. And this time it really does feel like the home stretch; we could have carried our bikes 25 miles if we had to, the finish felt that close. And can I just thank the organizers for providing hot chili at the last checkpoint; that was a key feature. Finally we have just ninety minutes left: a little blundering about near Menifee Lakes, another brush with fast traffic and no bike lane - this time in the dark - and all right whew yes YES! we have made it. So you marked the date, right? Yes, as I mentioned, tomorrow will be the anniversary's of Mark's hip replacement. So he was able to achieve the triple crown within a year. A pretty remarkable achievement; there are plenty of people with artificial hips walking around, but not so many who have ridden three double centuries within a year of getting them. Amazing.